Marlin Sportscars Ltd has been around since 1979 when it was founded in the U.K. by Paul Moorhouse. All six models that the company has produced have been based around other cars. They’re kit cars (even though you can technically buy one already built). The Roadster was Marlin”s first model, first introduced in 1979. Kits were sold up through about 1990 when a new model took its place. Original cars were based on the Triumph Herald while later cars (like this one) were based on the Morris Marina. The engine is a 1.8-liter straight-four. Marlin is still in business, building sports cars as they have been for decades. It you want a throwback roadster with pre-war or immediate post-war looks, and you’re on a budget: look no further. This is expected to bring between $2,300-$3,100. Click here for more info and here for more from this sale. 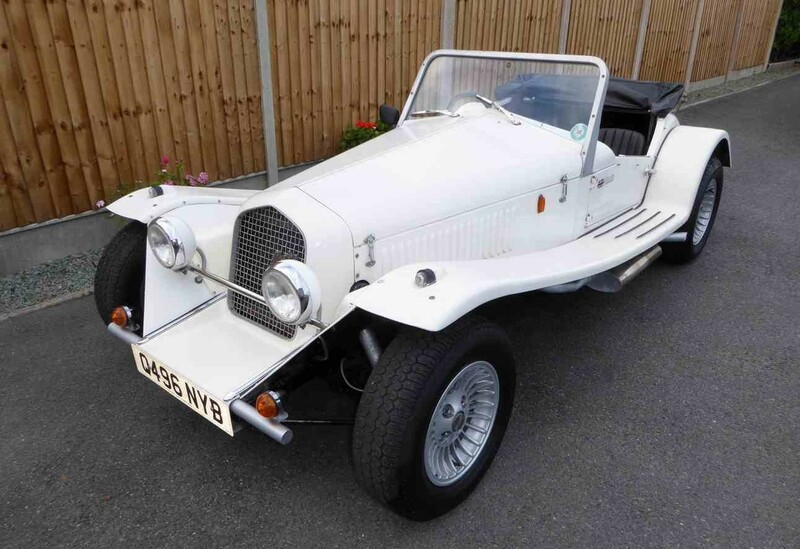 This entry was posted in Uncategorized and tagged 1800, 1990, auctions, brightwells, cars, classic cars, marlin, roadster by classiccarweekly. Bookmark the permalink.